Why read choreography? Why read choreography—in translation? 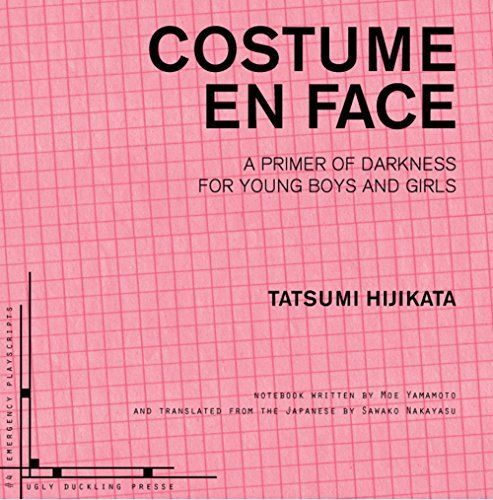 This stunning translation of Tatsumi Hijikata’s Costume en Face Butoh choreography notations (transcribed by Moe Yamamoto) is the collaborative work of series editor (Yelena Gluzman, UDP), Hijikata scholars at Keio University (Takashi Morishita), the translator (Sawako Nakayasu), and the book designer (Steven Chodoriwsky). Although of course deeply relevant to scholarship on Butoh dance for English-speaking scholars, this book is a marvel of poetic elision and evocative design. Nakayasu’s gifted compressions of Moe Yamamoto’s notes read as stage directions for a metaphysical revelation, textured by archetypal figures (from angels to Nazis), modernist paintings, and mythological figures. Her choice to include and briefly gloss specifically Japanese figures in brackets is clever and creates for a seamless experience that exposes the seams of audience. This strategy continually reinforces the transposition of intention this project represents: the audience is assumed to be more familiar with modern western art history than Japanese gods, and the notebook reads as an intriguing poem written in contemporary U.S. style. At the same time, Hijikata’s choreography and poetics—or, the conceptual difficulty of his notational poetics – comes through in fascinating relief. The result is of archival significance, preeminent readability, and responsible foregrounding of the work as translated. The layers of remove from Hijikata’s vision (manifest in his mind or in the ultimate performance of Costume en Face? this book asks) are preserved and amplified. Nakayasu’s translation is in dynamic conversation with the beautiful and thoughtful design of the book. The visual layout of Moe Yamamoto’s notebook is preserved and given space to breathe, with generous white spaces. Departing from the strict conventions of bilingual editions, two-page sequences will often be presented in Japanese first before the English translation. Sometimes the English translations migrate under the Japanese, so as not to distract from the drawings on several pages. This sensitivity to the original source not only has an elegance and integrity but also helps the reader refresh their understanding of the text, which might otherwise become mired in the visual complexity of the fragments. Overall, the many collaborators of this project have succeeded in creating an impressive aesthetic experience for readers while responsibly communicating the scholarly significance of the project and not erasing the translated nature of the text. A faithful innovation on every level, this work will be of interest to scholars of Butoh, translators, choreographers and dancers, and poets. Laura Ferris is a poet and translator based in the East Bay. She is an incoming doctoral student in UC Berkeley’s Comparative Literature program and has MFAs from the Iowa Writers’ Workshop and Literary Translation Program. She translates contemporary Latin American poets and writers. Recent poems appear in The Atlas Review, Beecher’s Magazine, and Bombay Gin.